Are you dreaming of a fabulous wedding like in the most romantic scenes of world-famous films? We can plan it for you. Italy is a country of passion. It is filled with mysterious love stories, incredible beauties of nature and exciting attractions of art. We will create for you a ceremony filled with sincere feelings, fabulous emotions and love. Wedding Italian is an agency that will create an individual style for your celebration. Our team is full of ideas and enthusiasm to create a fairy tale for you. We develop unique programs that fully comply with the wishes of our customers. We offer several choice packages for couples who want to make the most important day of their family unforgettable: • Official Wedding is the registration of marriage according to the law of Italy. Our support includes the organization of the ceremony, the preparation of festive images and a banquet; • Symbolic Wedding. If you want to refresh your feelings or give the marriage a sense of romance again, the Italian Symbolic Wedding would be the best option. New emotional colors, a lot of romance and tenderness on the background of amazing Italian landscapes will help to awaken new feelings; • Orthodox Wedding is a confirmation of your infinite love before God. In Italy, there are many Orthodox churches in which you can hold a church marriage. You can feel the real power of feelings in the temples near the Colosseum or on the seashore. Our coordinators organize your wedding for two in Italy the best possible way. In any city in Italy, we will create a celebration that will leave lasting indelible impressions about your love story and the creation of a small family. The charm of Venice will leave a memorable impression. Sicily will appreciate the bright sun with a wonderful view of the volcano and the sea distance. Bologna will arrange its gastronomic abundance and extraordinary attractions. Verona enchants with the charm of historical romanticism. Tell us about the wedding you are dreaming of and we will make it bring it to life. We know all regions, languages and customs well, so we will ideally plan your celebration. We will choose the ideal location, delicious cuisine, a professional photographer and more another. 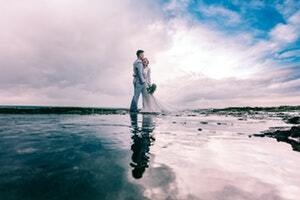 Do you want to know the price of planning a wedding in one of the most atmospheric towns in Europe? Fill out the form on our website or write to the email of the main coordinator.